Okay, but is Colin Kaepernick going too? As the New York Times reports and Mr. West’s representative confirms, Kanye is headed to the White House Thursday to meet with Jared Kushner and have lunch with President Trump. It’s been a hot minute since the pair hung out IRL, but between Kanye’s MAGA rant on SNL and POTUS’s praise for the same, it’s about time. According to the Times, Kanye is meeting with Kushner to discuss the criminal justice system, specifically “job opportunities for former convicts,” which maybe we should have anticipated from Yeezy’s recent criticism of the 13th Amendment. Kanye also reportedly plans to discuss the creation of “manufacturing jobs in the Chicago area,” West’s hometown, maybe current town, and the focus of Trump’s recent recommendation for stop-and-frisk, a practice the ACLU previously found to unfairly target black people and to be used more frequently by police in Chicago than in other cities. 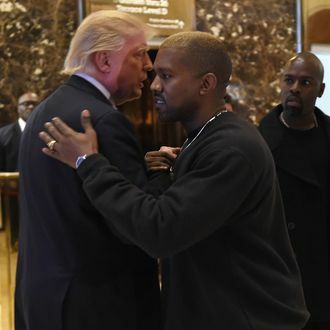 Kanye, of course, follows in the footsteps of his wife Kim Kardashian West, who earlier this year worked with Trump on the successful pardon of non-violent drug offender Alice Johnson. Now just imagine Jared and Trump, tapping their feet, enjoying their very own private Yandhi listening party.